It's that busy time of year. I finally managed to decorate our formal dining room. We are having a brunch on Saturday morning and a few dinner parties next week. I decided to use gold, since it's such a blingy color. Is that a word? ha ha. from Infuse With Liz. She saw this idea in the Orvis catalog. Thank you Liz for the inspiration. 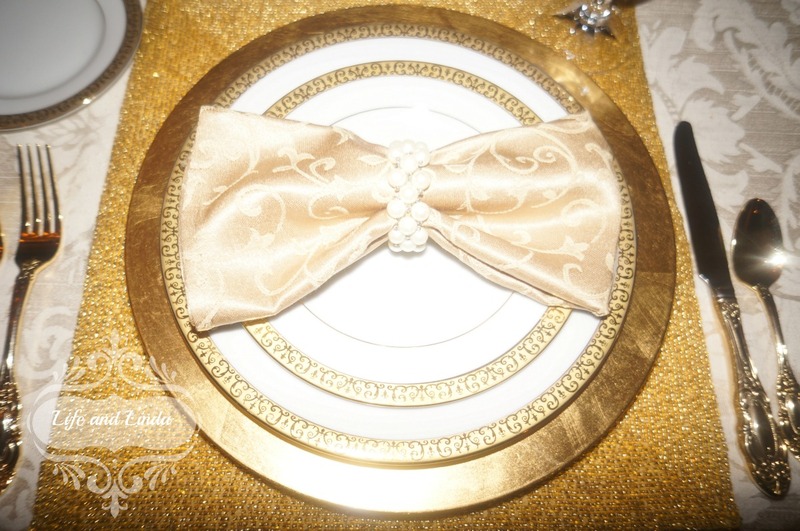 I know you aren't supposed to use placemats on a tablecloth, however I wanted the special bling and I also wanted to protect our table with a pad and tablecloth. I remember an anonymous person told me a few years back. One can never have too much bling! I created the name tags with my card program, Printmaster. I used the sticker template and chose snowflakes to compliment my theme. Dinnerware is Charter Club, Grand Buffet at Macys. 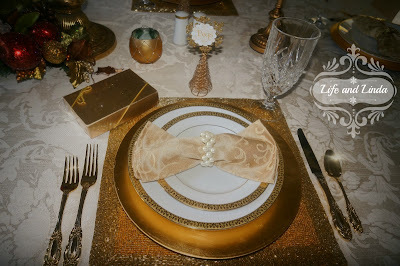 Notice the napkin in a bow with a pearl ring. The pearls tie in with the chandelier. I have quite abit of cooking and baking to do. Thank you for visiting and leaving me your sweet words. It's Beginning to look alot like Christmas @ Kathe With an E.
This is stunning!!! Very elegant and festive......and happy holidays to you too!!! You can never have too much sparkle during the holidays! I love how you decorated the chairs too! So pretty and festive!!! Gosh, Linda, this is so pretty! I love all of the sparkle and shimmer. Love those candleholders, too...my MIL gave me the same ones. I'm using them with my nativity. Your home, as always, is absolutely gorgeous! Oh my gosh it is gorgeous!!! I love that your dear are dressed up and the bling from the chandelier...Oh you are sooo right you can never have to much bling for the holidays! So pretty! Loving your decorating style! I now follow you on your blog and Pinterest! So happy to find you! I love your Tuscan decorating style! You might check out my Pinterest, Under Decor and Home Decor (Brookes Blonde Reality)! I think we have similar decorating styles! I Love this! Amazing. Outstanding. Whimsical.... I don't think I know enough words to describe it. So many details to dwell in and marvel in that you can serve water to your guests and they'll think they're tasting ambrosia!!!! Your table is gorgeous! 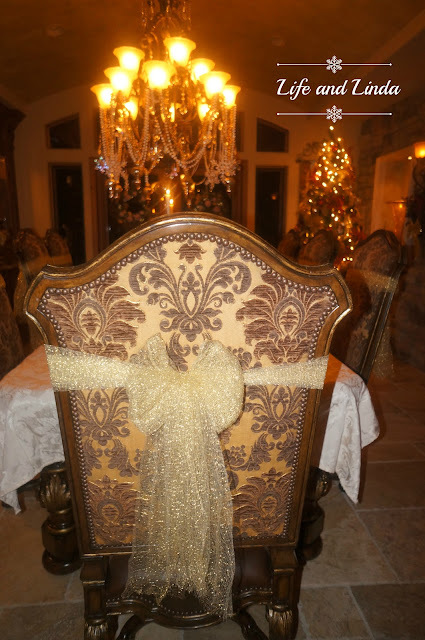 Love the gold bows on the chairs- perfect! 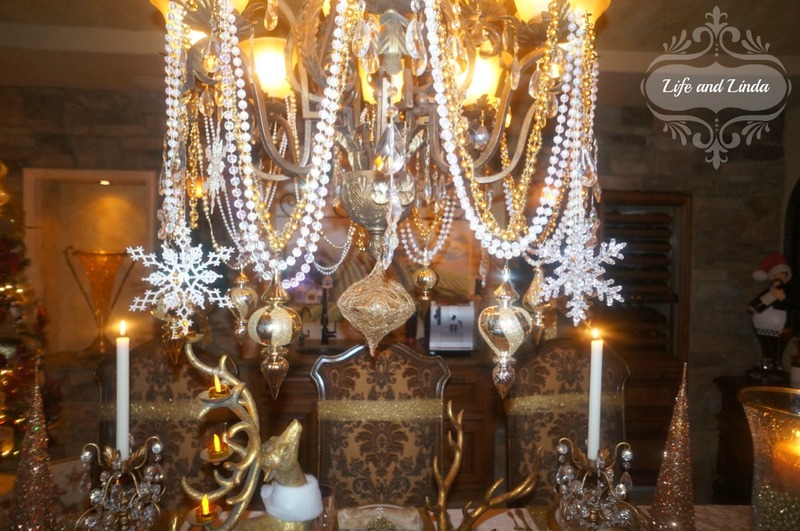 The center arrangement and the chandelier are very blingy and beautiful! I like the gold on gold on gold with the placemats, charger and dinnerware! Lovely tree too! What a beautiful space and your decorations are gorgeous!! 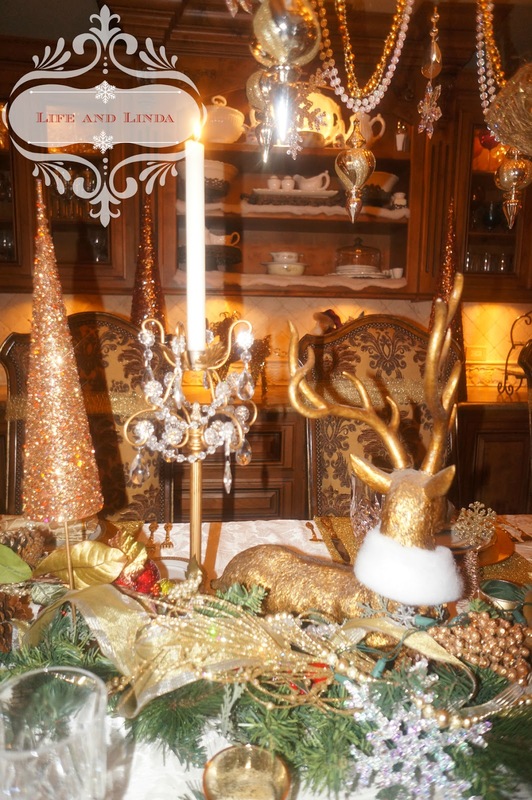 Linda, gold is always a Christmas stunner and I am loving every bit of this gorgeous room. I love to dress my dining chairs too. Yours are so gorgeous to begin with. I love their shape and fabric. Everything is glitzy and glamorous and I would love to sit down at this elegant table. Linda, it all looks so beautiful . Love the attention to detail... Very glamourous ! Have a happy season! What a glamorous deer and there is so much attention to detail. Linda, you amaze me! Every time I come over and visit, I get inspired to decorate my own home. The table setting is so pretty, and I love your chairs. The gold is a nice touch for Christmas. I just put pictures up of me and the girls' trees if you want to take a peek. Have a blessed day, my talented friend. You blinged the heck outta that chandelier, girl!!! Woo hoo! I'm proud of ya!!! That took some REAL work! I like the way you tied in the pearls of the chandelier with the napkin rings. Your tree is gorgeous, too. I love the ribbon treatment on it. I also really like the way you filled the table. It just makes it look so lush and lavish...the way a formal dining room table is meant to look during the holidays. The details like the crystal bobeches on the candlesticks and the fur collars on the reindeer just make it all that much more special. As for the placemats on the tablecloth, I do it all the time and don't care about any stinkin' rules! I think it's more about what looks good and what suits you. LOVE the treatment over the door!!!!!! It looks so regal! Beautiful decor, Linda! I hope you are enjoying it this holiday season! Wow your dinning room looks just divine! 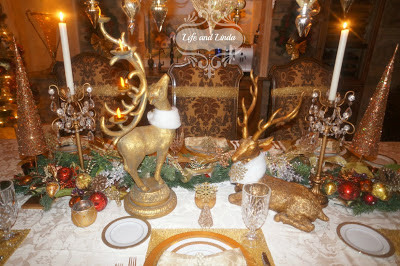 I love all the gold bling, and that cute little fur wrap around the deer is fabulous. Great post, we'd love to have you link it with us, too. 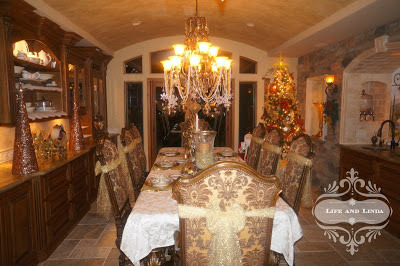 Hi Linda, your dinning room is divine all your decoration around your home are sooooooo... beautiful. What time is dinner? Beautiful Linda...just beautiful! 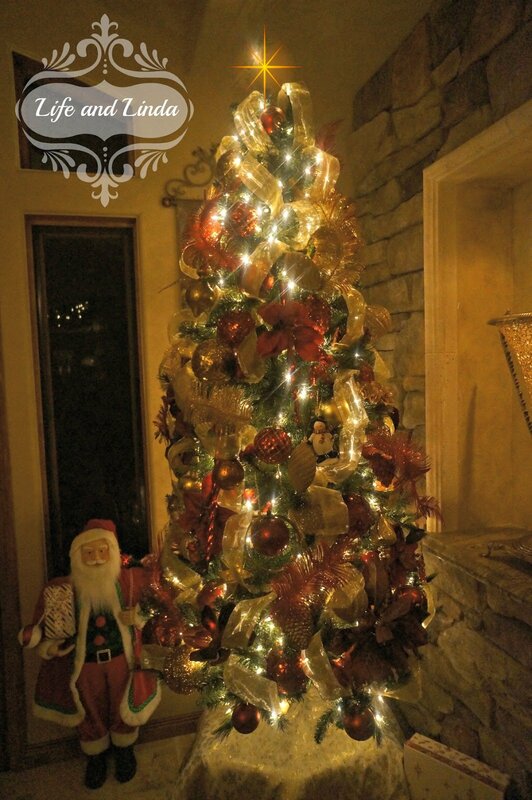 Your home is looking stunning for the Holiday. Linda, your home looks so festive and beautiful!!!! 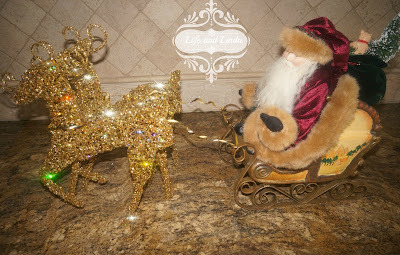 Love those gold reindeer. So,so gorgeous, Linda and of course I love that "bling" especially on your reindeer! Happy, Happy Holiday, my friend! Your dining room looks like it's from a stately manor! Gorgeous decorated in blingy gold and pearls for Christmas. Love that you draped pearls from the chandelier. Just beautiful Linda!! 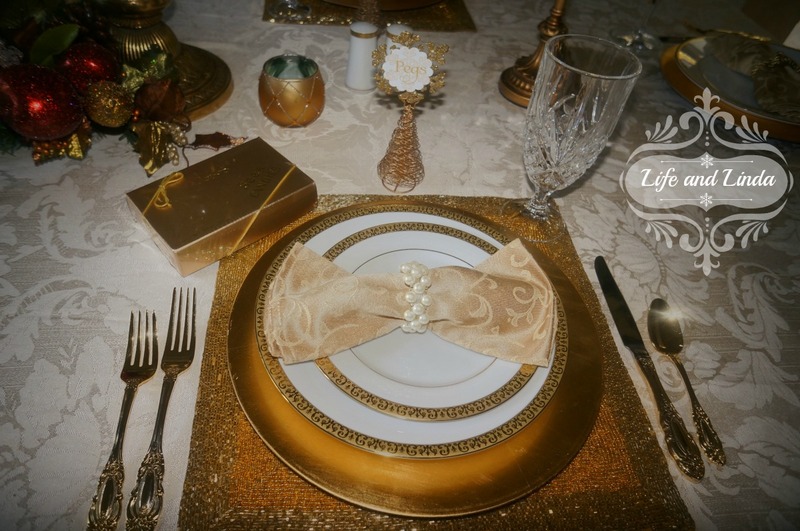 I love the pearls draped with decorations what a great idea. Have a BEAUTIFUL Christmas. Wow, love your Glitz and Glamour. So beautiful, you certainly have paid attention to detail. 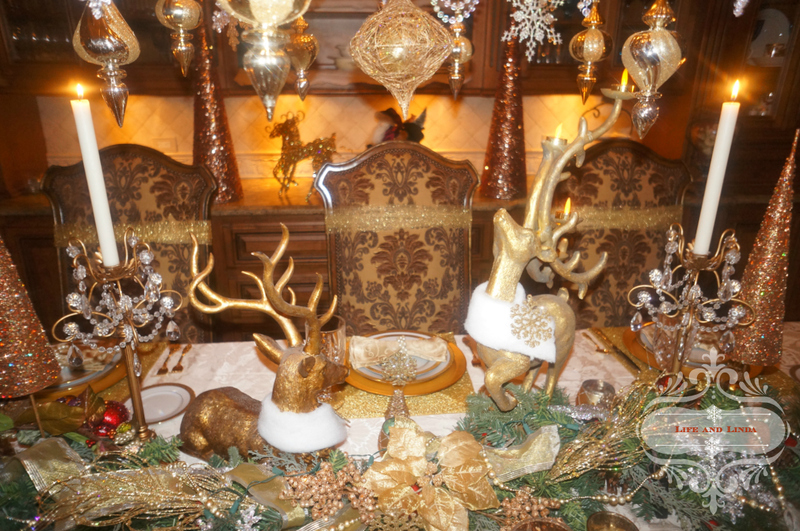 Love the elk in the centerpiece. Stunning, Linda! Your guests will feel extra-special when they see the beautiful setting you've created for them! Linda your house looks stunning!! Your chandy is amazing, you did an incredible job there! I did a little on mine, so now it looks plain next to yours, lol..Lucky guests to be at such festive and glamorous home for the holidays. Thank you for coming pretty lady, you put a smile on my face! Linda- Your dining room is beautiful. I love the barrel ceiling and the way the room flows. It looks like the perfect place to sit and have a grand dinner. Well if breaking the rules gives so much glamor then I love the plaecmats on your table. The BLING is fabulous!!! Such a gorgeous room to entertain. Thank you very much or sharing your FINE　work, my friend!!! I love how the reindeer comes dressed for the blingy occasion. Lovely napkins and holder. 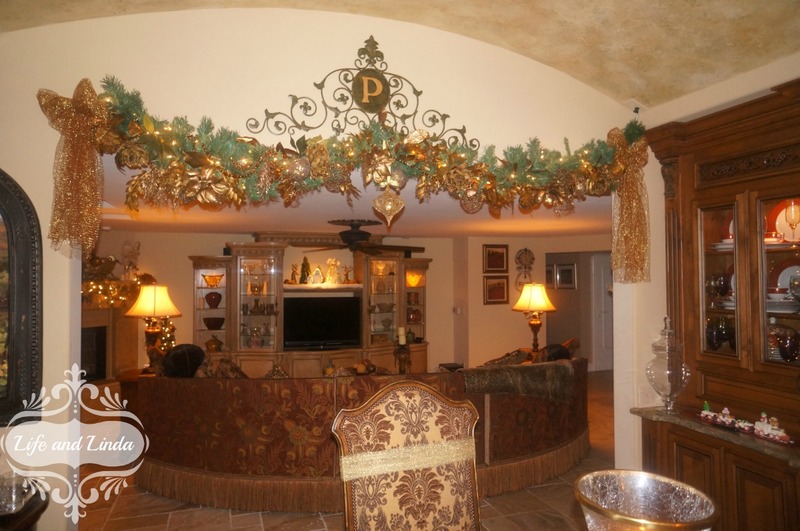 Linda, you did a beautiful job of decorating your dining room and I imagine the rest of the house too. Blingy is definitely a word in my book. Love the gold and pearls together and dressing your deer was the perfect touch. Wow!! Beautiful!! Linda you need to turn on your email. 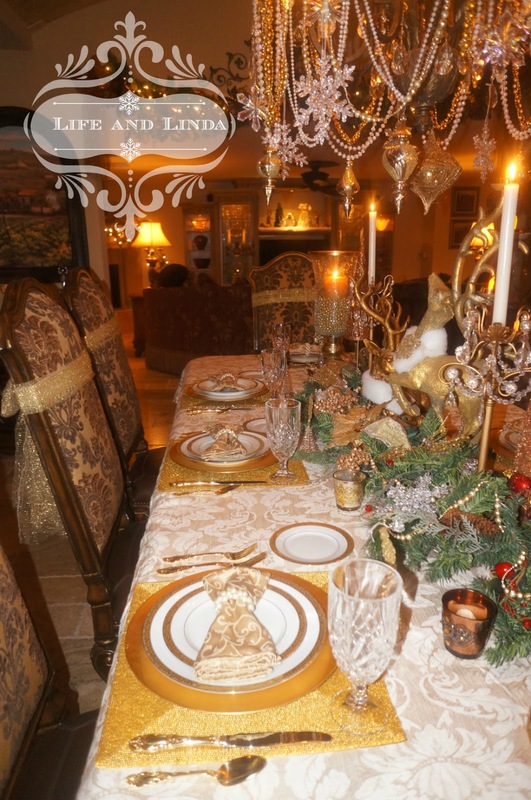 Your Tablecape is Beautiful as always for the Christmas Holidays! 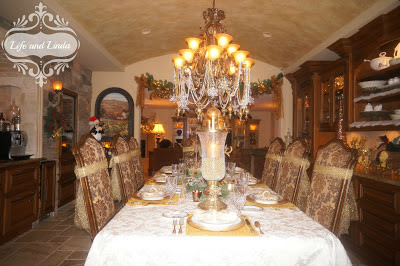 Love your gold bows on the chairs, and Your center arrangement and the chandelier are very beautiful! Linda your tree looks Lovely in this room.! I love your "blingy" table! Yes, it definitely is a word to me!! Enjoy all your parties next week. Merry Christmas! Your menu sounds fantastic! Your table is quite elegant too. I love a layered look and use mats on a cloth all the time. Besides it saves the cloth. Love your dressed up deer! Enjoy the festivities! Everything is blinged out and looks gorgeous! Love the wraps that you put on the chairs too, it's all just beautiful. I love your Christmas bling! Thank you or sharing at the Thursday Favorite Things hop xo P.S I keep forgetting to mention how much I like your header, sweeeet! Absolutely stunning, Linda! 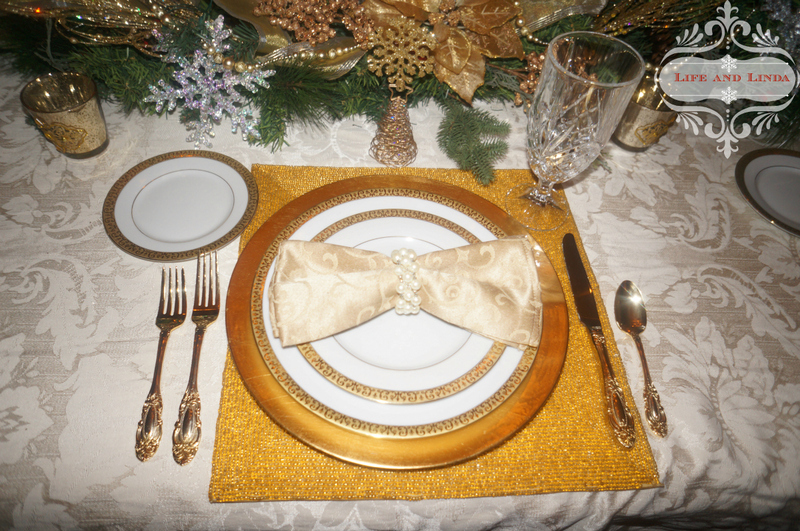 Gold is so beautiful in your dining room. And I say if you want to use placemats on a tablecloth go ahead...it just makes the layering all the more interesting. Beautiful Linda! Love all the bling. Blingy is definately a word in my category. lol! All of your glitzy touches are so fun. I think the placemats work great. Linda, your table is gorgeous! it looks like something out of a magazine spread. Very elegant. I have gold and cream and gold deers too on my table, but it doesn't look anything as glamorous as yours. Thanks for visiting my little blog project. Following you back now. Looking forward to seeing what other things you're up to. Hi, dearest Linda! As usual, everything looks SPECTACULAR. When can I move in?????? :-) You are amazing in so many ways, including of course being the Martha Steward of the foothills. I love the decorations in your dining room. Your guests will feel like they have entered a winter wonderland indeed. So magnificent. Your dining room looks beautiful, Linda, and definitely has a sparkle to it! I love how you dressed the deer!